Move over Mario, Dirk the Daring and Ace are rescuing princesses and saving the universe on the Wii this Fall. If you were a gamer in the 1980s, odds are that you spent at least some of your time in the arcade trying to help Dirk the Daring rescue Princess Daphne from Mordroc's clutches. The Dragon's Lair games and Space Ace (which pitted Ace against Commander Borf) were challenging, funny, and featured some absolutely beautiful artwork from animation legend Don Bluth. 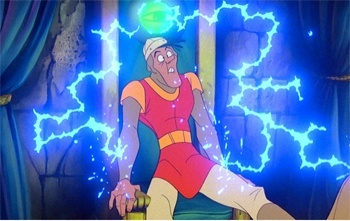 This Fall, the games are going to be released for the Wii as the Dragon's Lair Trilogy. The title will contain Dragon's Lair, Dragon's Lair 2: Time Warp, and Space Ace all on one disc. Not only will the original arcade gameplay modes (with remastered animation) be included, but the game will actually come with move guides for beginners, and a "Watch Mode" that will allow you watch all of the animation without actually playing the game (and swearing when you die for the umpteenth time). One thing that will certainly be interesting to see is how well these games play with the Wii's motion controls. Since Bluth's arcade games were, essentially, massive quicktime events that required you to react extremely quickly, it seems like the Wii might be a decent platform for the trilogy's incarnation. If nothing else, you'll be able to play through the games without spending a small fortune in quarters to keep on continuing. While the Dragon's Lair games were amazing productions when they dominated arcades in the 1980s, Dirk the Daring is an IP that has been consistently mined (some might say "whored out") on almost a yearly basis since then. For the most part, these ports have been unimpressive at best and horrible at worst. If Destineer can do a good job porting these games to the Wii, I'll have no problem forking $30 over to relive the original arcade experience.